The Lady T-Birds were short four players during the game against the Stafford Trojans, last night. The four Lady T-birds were sophomores Betsy Giles, Jessica DeWeese and Paige Orler and freshman Kamryn Stark. “The ladies weren’t able to play because Stafford had to forfeit the game earlier in the season,” assistant coach Lori Anschutz said. Knowing that Stafford had forfeited the game, Giles, DeWeese, Orler and Stark played in one game in the Junior Varsity tournament in January. Now, Stafford has enough girls for a team so they removed the forfeit and were able to play again. According to the Kansas State High School Activities Association you can only play a certain amount of minutes during the season.The four girls had to sit out and cheer their teammates on from the sideline, because they had already played in the tournament. With the season beginning to wind down, the Lady T-Birds have had a good season, in winning seven out of 16 games. 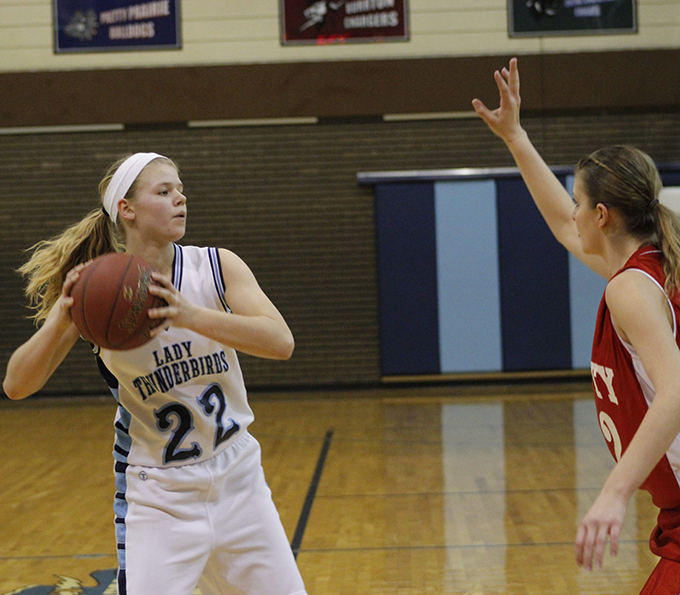 The Lady T-Birds only have four games left to play before the Sub-State tournament. They play at Cunningham, at Norwich and then they play their last home game against Central Christian. That game is also senior night. They play at South Barber to close out the season on Feb. 25. Sub-State is going to be hosted by Kiowa County at the beginning of March. So far the girls are a six seed and would be playing against Kiowa County.